The Driftwood 8'0" - Goosebay Sawmill and Lumber, Inc. The 8’0″ Driftwood is the performance hybrid. 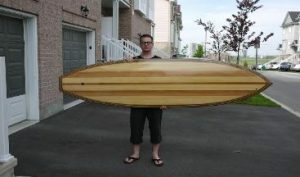 This board has enough volume to easily float riders in the 180 pound neighborhood The driftwood is a longboard that thinks its a shortboard. Its the nose and tail have been narrowed giving sleek lines and awesome speed and maneuverability. You’ll be cranking turns you never thought possible on a longboard.